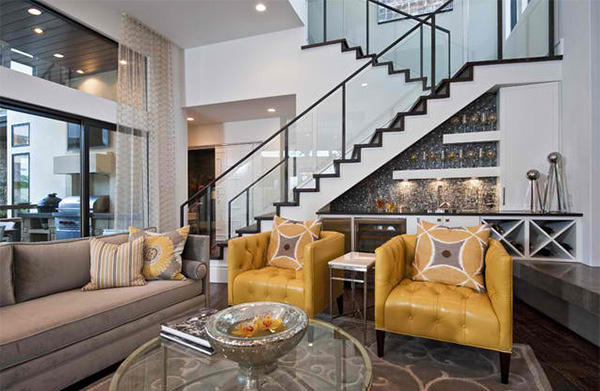 Homes with an upper level or a lower level would utilize staircases. 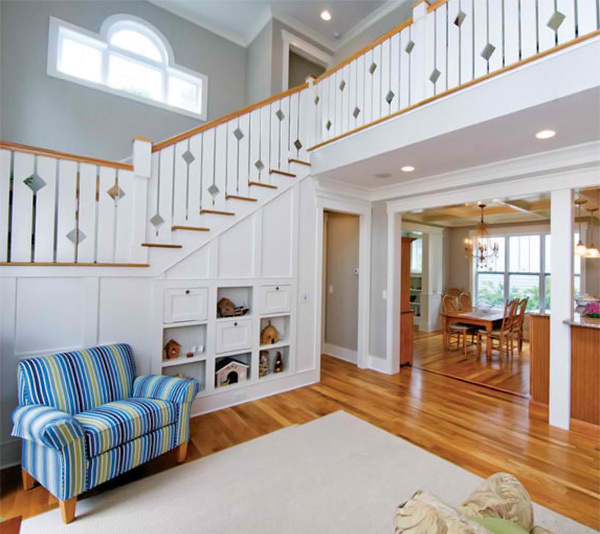 A staircase connects different levels of a house through a series of a flight of steps. These are made in different materials but have the same functions. 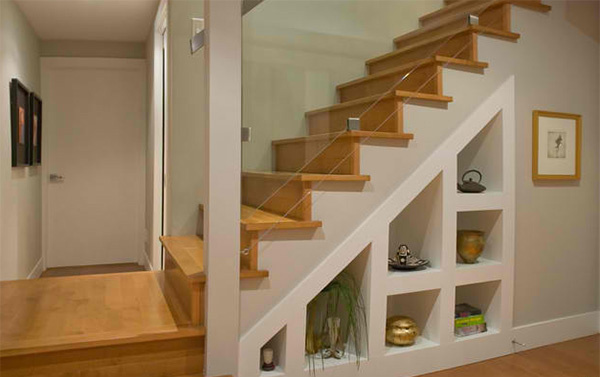 But some opt to add storage areas in the staircases either over or under the stairs. 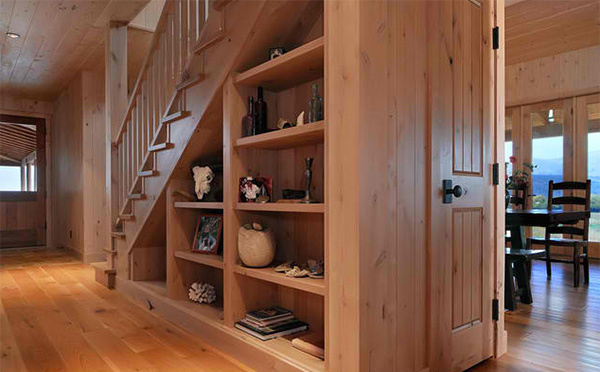 When we say staircase storage, they vary in design and style. There are drawers on treads or closets under the stairs. 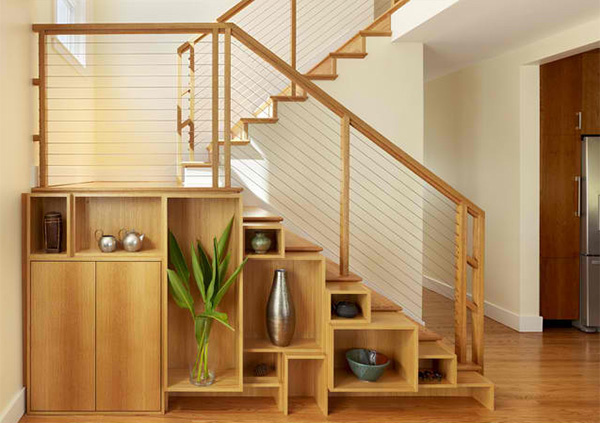 But today, we will show you some shelves that are added under the stairs which is a good way to save space and utilize the area in a good way. 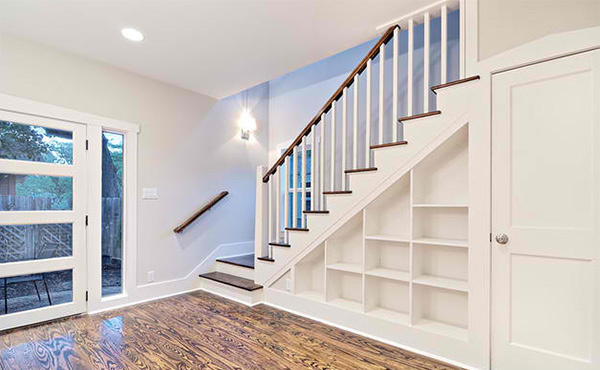 Take a look at the list we have for you today so you can get ideas on what you can do to that area under your staircase. 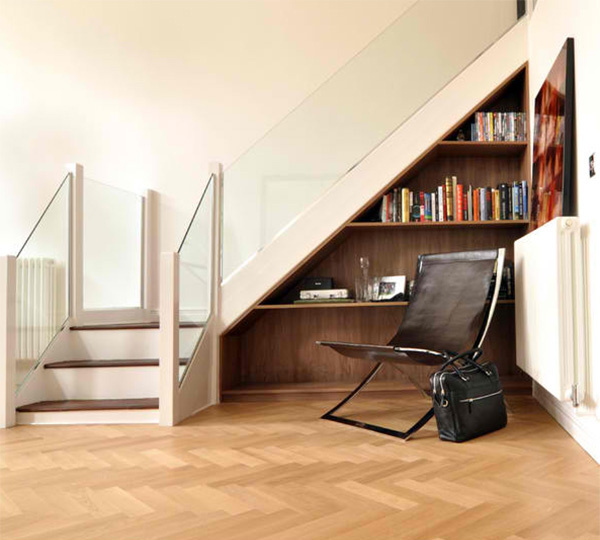 We know that the yellow chairs are lovely but take a look at the shelving under the stairs, isn’t it pretty too? Look at what they did to the staircase of this house. The treads were extended to facilitate a shelving. 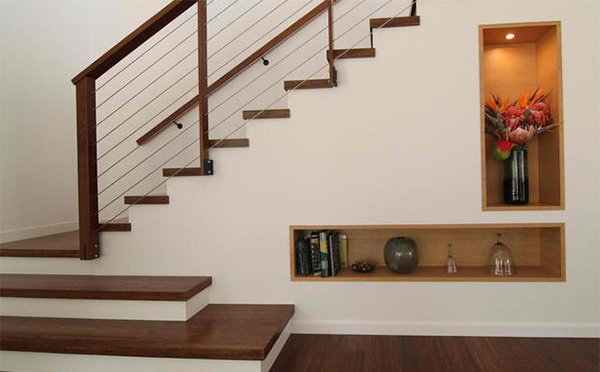 We love the design of the shelf on the stairs. 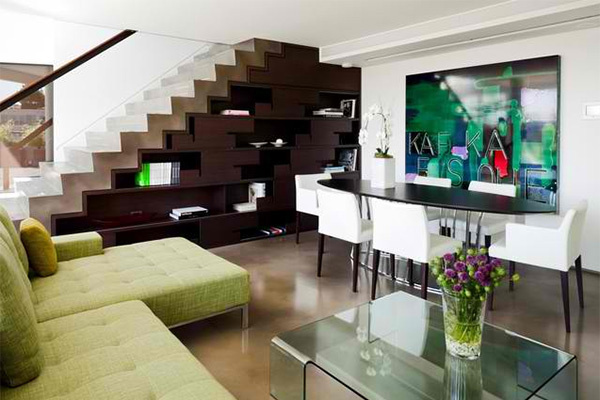 It is very gorgeous using geometric design to cover some areas. Tucked away under the stairs, this streamlined media center hides unsightly cords, preserves precious floor space, and boasts back-lit alcoves for display. 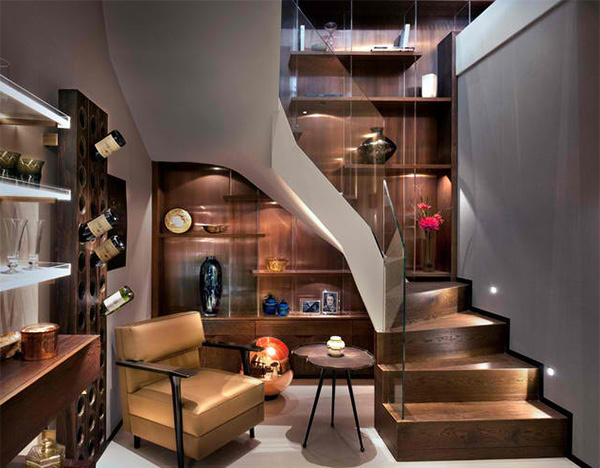 Rich wood details are used for this staircase which was treated as a piece of furniture adding a custom design of box-like shelves and closed storage doors animating the elevation. This is one stylish shelf design. You can see that the shelves are also seen above the stairs. 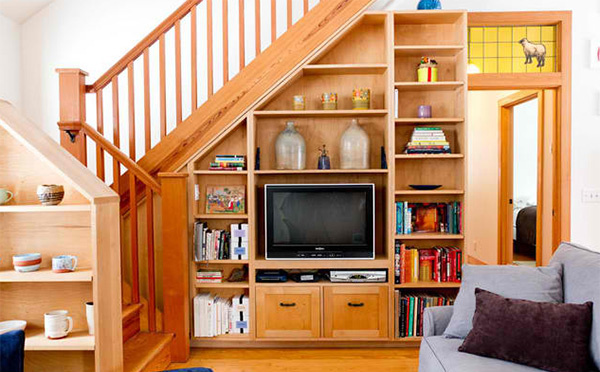 A triangular shelf was inserted under the stairs and contained books as well as a desk for reading. 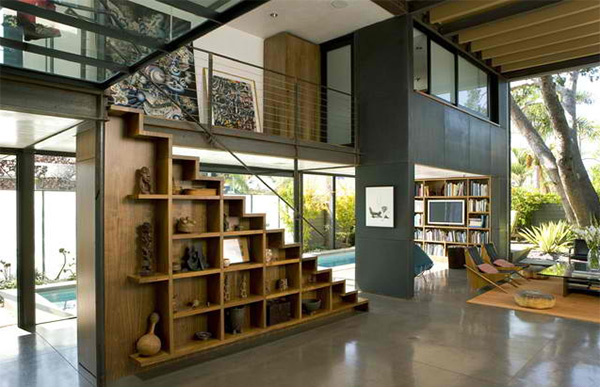 The shelves under the stairs are a good way to display items that have value to you. Aside from a display area and bookshelf, this is also a perfect spot for the media center. 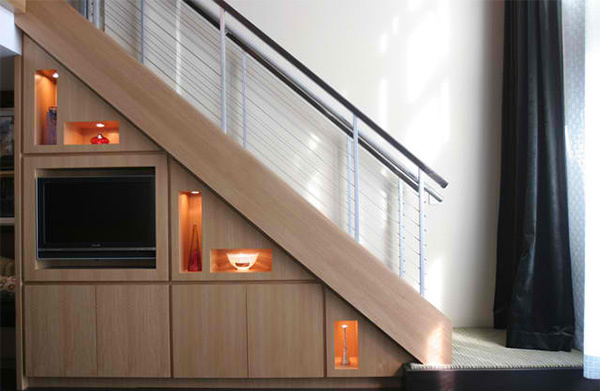 You don’t always need to follow the design of the inclination of the stairs to cut a shelf. You can also add some boxes like this one. Open shelves and closed ones were added under this beautiful white stairs. Aside from this shelf which, the other half is for storage accessed from the downstairs suite for a snowboard or other such things. 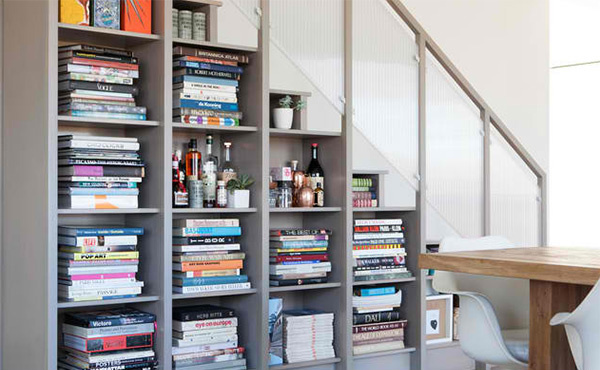 A book collection was arranged in strong horizontal lines for a more modern look. Two cubes in the shelf were used to keep the wine for the homeowners since they wanted to have their own bar. Another under staircase bookshelves where in the bottom ones have drawers in them. 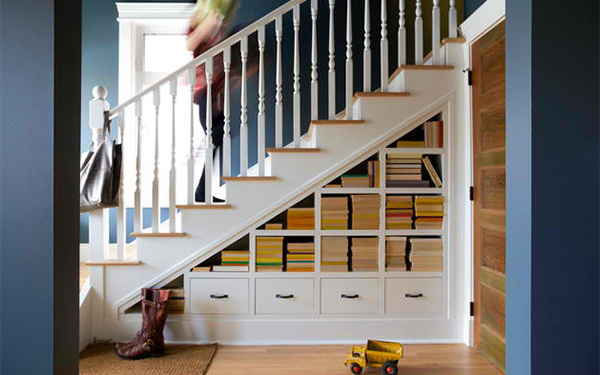 Innovative and open built-in shelves under traditional craftsman staircase. It is empty in this picture and we can tell that it would look even more lovely once the display items and books come.